Our Digital Printing departments can produce your marketing materials with outstanding quality at affordable costs. With 8 color plus white capabilities up to 1000 dpi your product will look outstanding! With up to 126" wide and up to 2" thick both rigid & flexible substrates you have the option to create your ideal advertising piece. Up to 2400 sq/ft printing per hour produces results fast to meet your needs with our 3 year ink durability for digital printing. Your options are limitless when it comes to producing an eye catching piece for your business. 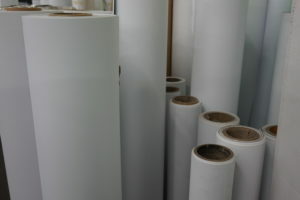 From large to small we got you covered on a number of various substrates from paper to plastics. Let us know what you are looking to produce and we will help you find the best suited materials to meet you projects requirements. We also have the ability to produce your items with a custom die-cut shape cutout to your specifications. Great for creating store front signage, banners, floor displays, window/floor graphics, countermats & much more.